If you’re like me, then your smartphone is probably plastered to your hand during most waking hours. Our generation is the first of its kind in that we have access to unprecedented resources at our fingertips. 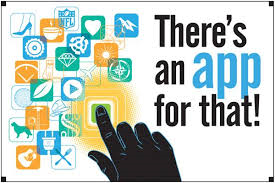 In matters of money, love, friendship, networking, and healthy living, more than likely There’s an app for that. And so, without further ado, my top-ten list of must-have apps for your twentysomething life. One of the sure signs of being in your twenties is that money magically disappears from your bank account at an alarming rate. Payday is on Friday, but by the time you account for rent, food, insurance and other miscellaneous bills, you’re desperately searching the couch cushions for loose change by Saturday. Luckily, Mint gives you a better way to manage your money. The app allows you to categorize and track all of your spending and shows you areas where you can save money. You never know, you might actually be able to afford to biggie-size your fries after all. You go Glen Coco. Once upon a time, there was a college undergrad who thought that the key to a good cocktail was to grab any kind of liquor and mix it with any kind of juice and ¡voila! mixology magic! It didn’t matter if you put so much alcohol in it that you could barely swallow because hey, drinks aren’t supposed to be fun, AmIRight?! Umm…many rough mornings later, I’ve learned that the secret to avoiding that “Dear-God-If-I-Survive-This-I-Swear-I-Am-Never-Drinking-Again” feeling is to Know. What. You’re. Doing. The iBartender app provides easy drink recipes to impress your family and friends with. Plus, my favorite feature of the app is that it allows you to choose which ingredients you have available and gives you a list of drink recipes that are actually acceptable for human consumption. Say it with me: paying for gas makes me want to cry. I don’t know, just something about spending almost four dollars for ONE gallon of gas just kills me a little inside. Thank GAWD all the stars aligned and somebody created the GasBuddy app. This little gem finds the cheapest gas based on your geographical location! Never underestimate the benefit of saving a few pennies at the pump. Those pennies definitely add up! Do we even really need to discuss this one? Social media is, in essence, the bloodline of our young adult lives. We are a generation that needs to be connected 24 hours a day (whatever you definition of connected may be). Social media is like one-stop shopping: you can (not so) secretly stalk your exes, keep up with what your high school lab partner had for lunch today (because some things you just need to know RIGHT NOW), and get the latest news and gossip all in one place. Downloading the app(s) on your phone ensures that you never miss a minute of the action. A few notes: 1) You are not invisible online. You never know who is watching what you like/post/tweet so keep it classy. 2) Snapchat is not an excuse for you to expose your kibbles and bits to the world. Put your clothes back on. 3) Taking selfies is, like, a thing now. I get it. However, please feel free to take pictures of something else. Thanks, Management. If I had to assign the most important word to the twentysomething years, it would be networking. After four years of undergraduate study, you are the proud owner of a shiny new diploma. Now the question is, what are you going to do with it? The job market is as competitive as it’s ever been and no one is going to know who the hell you are or what skills you have if you don’t market them appropriately. Every twentysomething should create a LinkedIn account, like NOW. This vast network of employers and companies is the perfect pool for you to cast your poor little unemployed net into. Use the app like a mobile resume: update your most current employment, add useful skills, and make connections with people in fields that are important to you. There is nothing – NOTHING – like being able to watch your favorite movies and TV shows while you’re dying of boredom in the waiting room of your doctor’s office. For just a few dollars a month you can have access to unlimited OMG moments wherever you are. Because sorting out that super awkward love triangle between Olivia and Fitz and Mellie all of a sudden makes sitting in that waiting room not so bad after all. Candy Crush. Flappy Bird. That is all. This is one of my favorite apps for two reasons. For one, it saves me a ton of storage space in my phone because I can have all the music I want in one app instead of downloading my entire music library (complete with notable Miley Cyrus throwbacks before she was, you know, Miley Cyrus) to my phone. And secondly, Pandora stations are perfectly suited to whatever mood I’m in. I can switch to 2 Chainz radio when I wanna twerk somn’ giiirl, or throw on some John Mayer when I want to eat junk food and cry about why I’m not rich and famous like Beyonce. Either way, it just works. This app is one that I just discovered recently and, let me tell you, this app was MADE for people like me. There are those of us who are…ummm…challenged in matters of culinary technique, and that’s okay! Because now, there is an app full of recipes broken down into every category imaginable. For example, the home page right now has recipes for chocolate desserts, spring cocktails, mother’s day dinners, quick breakfasts, and Easter desserts, just to name a few. Now, with just a click (tap?) you can find a list of ingredients and instructions to create actual real life meals. Because although Cinnamon Toast Crunch fulfills all the desires your twentysomething heart and stomach could ever have, I think we can do a little better. Rouding out my top ten is the My Fitness Pal app. Y’all..this thing is incredible. Some of us can remember a time when we could fold into a pretzel with no problem. Nowadays, climbing the stairs is the world’s greatest struggle and trying to bend over and touch your toes is just…not gonna happen. Luckily, this app is for all the fitness backsliders of the world. It allows you to keep a daily journal of food intake, calories consumed, and exercises performed. It also keeps you on track so that you can get healthy and lose weight in a safe and appropriate amount of time. Plus, you can add your friends and help keep each other on track. Summer is fast approaching-time to get it right, get it tight!